"I mean to have you, even if it must be burglary." Don't get me wrong, I love British humor, but to be assaulted with two viewings of Billy Liar broken by Withnail and I is almost too much to cope with. At least I was primed for the dense English, or at least I thought I was�thank god for subtitles. From the moment this film was announced for DVD I've seen people raving about it, but after one viewing I don't know whether to love it or hate it. Withnail and I is certainly is chock-full of witty dialogue, and its quotability factor is very high, but I'm failing to see the humor here. It is the end of the 1960s, Withnail and his roommate Peter (aka "I") are out of work actors living in a slummy part of London in a dump of an apartment. They are behind on the rent; dishes and other nondescript but possibly organic materials ooze from their kitchen sink. Their primary focus is the intoxicant of the hour, with speed and alcohol being prime candidates; when desperate, lighter fluid or any other household solvents will suffice in a pinch. Neither is doing well in this environment, and Peter is feeling the constrictions of this lifestyle closing in on him. Desperately, with a mounting paranoia, he suggests that Withnail contact the uncle he had mentioned, who supposedly has a quiet place in the country where they could feel a little less stifled. This leads them to a meeting with the decidedly homosexual Uncle Monte, who also fancies himself a thespian, in more than one sense of the word. After applying a sufficient amount of inebriation to the situation, Withnail and I get the keys to the country cottage, and they set off for the weekend. Of course, as one would suspect, things don't turn out quite as planned: with no food, fuel or most importantly, booze, the pair are at wit's end. When the locals turn out to be somewhat eccentric and none too obliging, Withnail and I make their way to the local pub, and with Withnail's talent for fibbery, manage to weasel enough liquor to hold them over for a while, until the local poacher shows up, offering an opportunity to acquire foodstuffs. Unfortunately, things turn ugly, and when the pair return to their cottage, they fear that the noises they hear in the night are the poacher out to do them in. I know this is supposed to be funny, and there are moments that would crack a smile. But I see little humor in a portrayal of obsessive alcoholism, despite attempts to keep things lively with a healthy dose of homophobia tossed in, fueled by the very determined Uncle Monte. While it may seem fun to see a pair of pathetic losers bungle about in a drunken stupor whilst trying to avoid being buggered, this humor failed to rub off on me, try as I might to get into the swing of things. Perhaps this requires a few viewings to properly accept the film, but I highly doubt I'll be drawn to this again, any more than I'll enjoy watching Leaving Las Vegas anytime soon. I WILL say that the portrayals are quite well done by all, and Richard E. Grant is a brilliant drunk. I did enjoy Ralph Brown's character, Danny, the mung-mouthed drug dealer, who quite reminds me of Bill Murray. The craft of the film is well-executed, the script is full of memorable language, and the pacing is tight and well-timed. The story was inspired by director Bruce Robinson's real life experiences, and I don't know whether to find that funny or sad. While certainly worth a look, I won't be recommending this one, at least not for now. Image Transfer Review: Withnail and I is presented in a nonanamorphic 1.85:1 transfer. Print defects are extremely rare, colors are earthy, and the film's natural lighting is well-represented for the most part, though a few scenes look overly dark. The main issues are due to the non-enhanced nature of the transfer, which leads to a soft, unfocused look when viewed on a widescreen set, with evident line structure and its inherent aliasing as a result. Given the hype surrounding this film, I would have expected a bit more attention paid to delivering a great presentation, as the cinematography looks like it could be pretty good. This is easily passable, but not exceptional. Audio Transfer Review: Mono audio is clear aside from some of the dialogue, which is difficult to discern (more from the heavy accents than any technical issue). Frequency response is well-covered, and I would note that the soundtrack is especially loud. Extras Review: While the menu design is certainly stylish, it lead me to completely miss the 24m:50s documentary included. 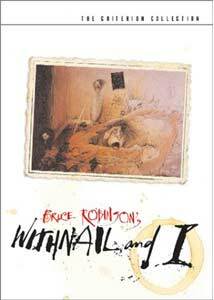 Eventually, I did find it: Withnail and Us, produced in 1999 for Channel Four Television, takes a look back at the phenomenon that Withnail and I has become. Featuring interview footage with director Bruce Robinson, Robert E Grant, Paul McGann, Ralph Brown and members of the crew�as well as fans�the documentary tries to expose Withnail's popular appeal. Having watched this after seeing the film for the first time, it is a little easier to appreciate what people see in the work, though I'm not sure I like it yet. A photo gallery comprised of 20 black and white shots is included on the disc, as is the nonanamorphic theatrical trailer. The package does contain a limited edition poster of the original film art by Ralph Steadman, and a brief essay, which was the original forward to the script by Bruce Robinson, to the man who inspired his film. As Bruce Robinson's debut film, Withnail and I takes a rather caustic look at those whose sole mission in life is self-indulgence, primarily in the form of alcohol. An accidental weekend vacation tests the friendship of two unemployed actors and ends up filled with drunken mayhem—I can see how it appeals to certain audiences, but its reliance on alcoholism may be a bit much for those who don't find the subject amusing. Criterion delivers the uncut version here, though I'm a bit unenthusiastic about the presentation. Perhaps I should have had some booze before watching.